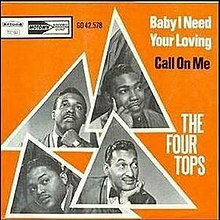 (1962) "Baby I Need Your Loving"
(1964) "Without the One You Love (Life's Not Worth While)"
"Baby I Need Your Loving" is a 1964 hit single recorded by the Four Tops for the Motown label. Written and produced by Motown's main production team Holland–Dozier–Holland, the song was the group's first Motown single and their first pop Top 20 hit, making it to number eleven on the Billboard Hot 100 in the fall of 1964. It was also their first million-selling hit single. Rolling Stone ranked The Four Tops' original version of the song at #390 on their list of the 500 Greatest Songs of All Time. Lead vocals by Levi Stubbs. Background Vocals by Renaldo "Obie" Benson, Lawrence Payton, Abdul "Duke" Fakir, and The Andantes: Jackie Hicks, Marlene Barrow, and Louvain Demps. Instrumentation by The Funk Brothers and the Detroit Symphony Orchestra (strings). Written by Brian Holland, Lamont Dozier, and Edward Holland, Jr.. Produced by Brian Holland and Lamont Dozier. (1966) "Baby I Need Your Lovin'"
(1967) "The Tracks of My Tears"
"Baby, I Need Your Lovin'" was a slower, 1967 cover by Johnny Rivers. It reached #3 on Billboard Hot 100, topping the original version in chart performance. It is included on his 1967 album Rewind. Lead vocals by Johnny Rivers. Background vocals by The Blossoms: Darlene Love, Fanita James, and Jean King. The Fourmost released their version of this song, reaching #24 in the UK in November 1964. Marvin Gaye also covered it as a duet twice, first with Kim Weston in 1966 and later with Tammi Terrell in 1969. O.C. Smith covered it and took it to #52 in 1970. Eric Carmen took it to #62 in 1979. Carl Carlton also covered the song in 1982, reaching #17 on the U.S. R&B charts. Hits Of The Sixties: The Million Sellers - By Demitri Coryton and Joseph Murrells (pg 100). ^ Gilliland, John (1969). "Show 50 - The Soul Reformation: Phase three, soul music at the summit. [Part 6] : UNT Digital Library" (audio). Pop Chronicles. University of North Texas Libraries. ^ "Rolling Stone's 500 Greatest Songs of All Time". Rolling Stone. April 2010. Retrieved October 1, 2015. Here We à Go Go Again! "(I Washed My Hands In) Muddy Water"
"Swayin' to the Music (Slow Dancing)"
"Um, Um, Um, Um, Um, Um"
"Never Gonna Fall in Love Again"
"I Wanna Hear It from Your Lips"
This page was last edited on 19 January 2019, at 07:57 (UTC).